You don't realize you live in the South until you go North. People there don't revere cornbread and greens the way Southern people do. In some ways, parts of Virginia don't have much of a Southern vibe. Virginia Beach is one of those places, especially in the touristy parts of the North End where the boardwalk lives. But people there, like everywhere in the South, know their good cornbread from their boring cornbread. My uncle, who grew up in Tennessee, tells me cornbread always had flavorin' in it. In fact, almost anything good had flavorin'. Flavorin' is rendered pork fat, by the way. I can't deny that lard must make cornbread taste incredible. But for we who abstain from eating animals, cornbread needs at least two good, swift kicks in the flavorin' department to even sit next to lard cornbread on the bus. That's where kefir and Summer bounty come in. A man's happiness can't be qualified by the tastiness of his dinner. But it can be measured, in some small way, by the look on his face after that first bite. Even if it's but a fleeting moment of kindness washed over his mind in the form of a perfect bite of lemon meringue pie. Or a hunk of fresh, crisp-edged cornbread full of ripe red slices of tomato, shallots, and sweet pepper. Cornbread is, by nature, a non-complex food. It only requires a couple of tricks: enough fat and moisture to get a dense, cake-like quality; a hot cast iron pan, into which we pour the batter; and plenty of salt and pepper. This cornbread happens to remind me of pizza, to be honest. Eating it straight up in thick slices, big roasted tomato and shallot flavor hitting me in the face. If this had basil in it, it would most definitely require a re-naming. I like to throw whatever Summer veg I have lying around in here -- okra, jalapeño, spinach, shishito peppers, fairytale eggplant, you name it. As long as your veg is not too watery (there's enough liquid in the tomatoes that needs to be cooked off, already), almost anything will work. Speaking of pizza, I'm doing a pizza party for my birthday!!! 2nd grade style. But with fancier toppings. There's a pizza place here called "Dr. Ho's" on route 29. Everyone raves about this place. I can't eat there, but I figure those who can eat wheat will be suuuuuper psyched. I'll make some gluten free and einkorn crust pizzas too. Ok enjoy this badass recipe based on the MOST badass recipe by Alana TT. of Bojon Gourmet. Preheat the oven to 375F. Coat the bottom of a large cast iron pan with olive oil. 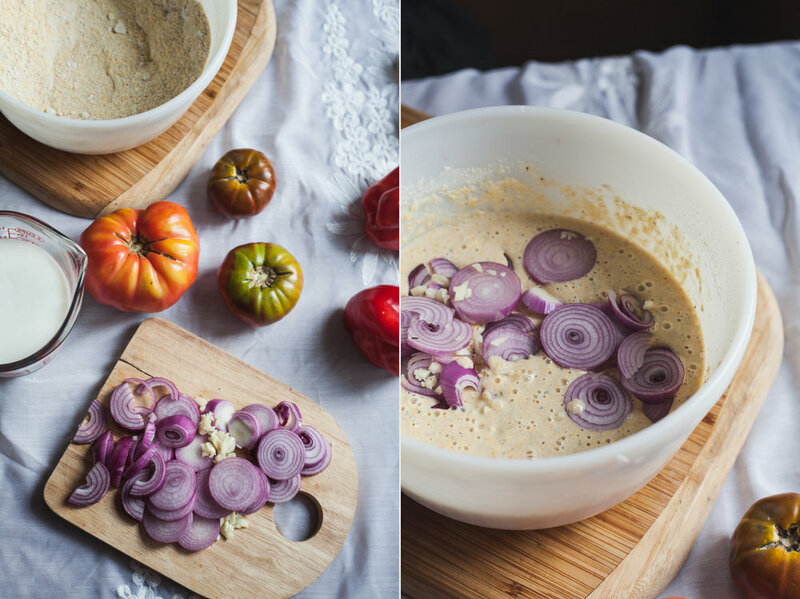 Place your pan in the oven to heat while you prepare your batter. In a large bowl, combine the corn meal, oat flour, white rice flour, baking soda, baking powder, salt, and pepper. Add goat yogurt and eggs, and stir to incorporate. Add garlic, red onions, red pepper, and about ¼ cup of the sliced tomato (I reserved the less-than perfect looking bits to be stirred into the batter). Add the goat cheese in one inch chunks to the batter, and stir to combine. 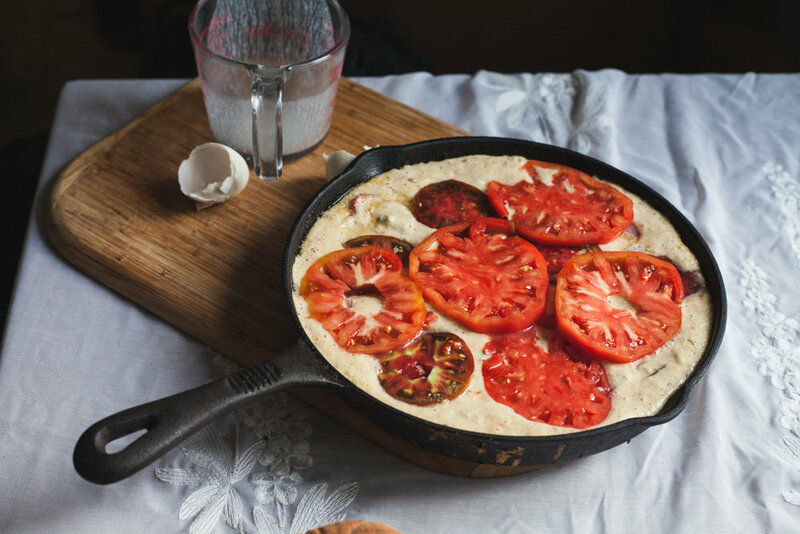 Remove the cast iron skillet from the oven (carefully!) and pour the batter into the hot pan. 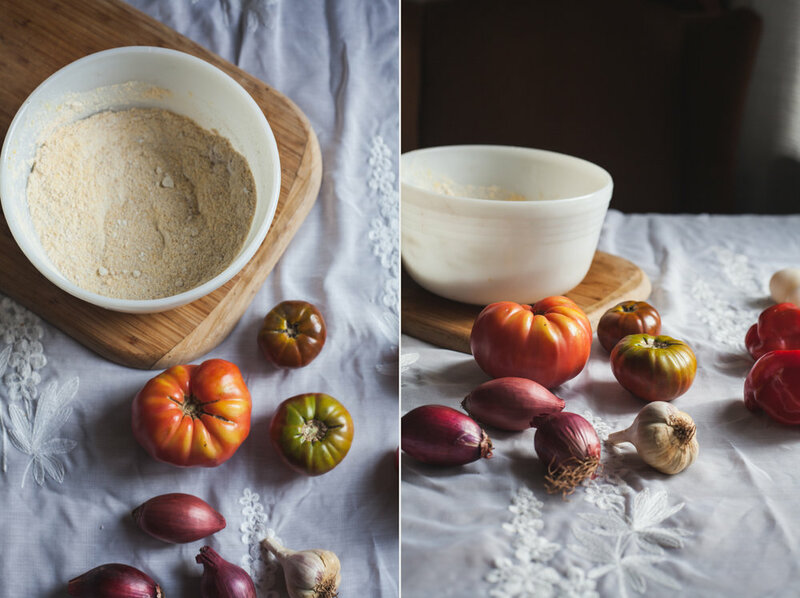 Top your cornbread batter with slices of the heirloom tomato, arranging as you please. Bake for 45 minutes -- the top of the cornbread will be golden brown and a toothpick inserted in the center should come out clean. Let cool in the skillet at least 1 hour before serving.